About this object Chisholm won election to the 91st Congress (1969–1971) running under the slogan “unbought and unbossed,” to become the first African-American woman in Congress. On this date at the opening of the 91st Congress (1969–1971), Shirley Anita Chisholm of New York became the first African-American Congresswoman. Trained as a school teacher, Chisholm served two terms in the New York state legislature before winning election in November 1968 to a newly created congressional district in Brooklyn. 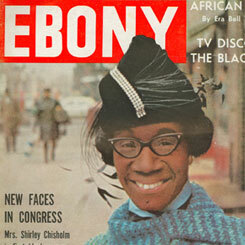 The only woman among the freshman class of the 91st Congress, Chisholm took the House by storm. “I have no intention of just sitting quietly and observing,” she said. “I intend to focus attention on the nation’s problems.” Chisholm continued to work for the causes she had espoused as a community activist. She sponsored increases in federal funding to extend the hours of daycare facilities and a guaranteed minimum annual income for families. She was a fierce defender of federal assistance for education, serving as a primary backer of a national school lunch bill and leading her colleagues in overriding President Gerald R. Ford’s veto on this measure. In 1972, she mounted a longshot presidential bid that nevertheless received national attention. In 1982, after seven terms in the House, Chisholm declined to run for re-election to the 98th Congress (1983–1985). She stated that she had become disillusioned with the conservative politics of the Ronald Reagan administration and factionalism in Congress. After leaving office, Chisholm taught and remained active in political organizations, but never again sought elective office.